This is most definitely my favorite lunch. I work from home, so I can easily run downstairs and throw together 'the big salad' with whatever veggies that I have on hand. When I did work in an office I would make it for transport and dress it at work. Yes, I kept extra virgin olive oil and balsamic in my office, however, you can easily mix that in a small container and dress your salad right before eating it. I start with chopped romaine, baby romaine or mesclun greens. All organic, if possible. Then add tomatoes, cucumbers, Kalamata olives, turkey or ham, beets, and whatever other veggies I have in the fridge. 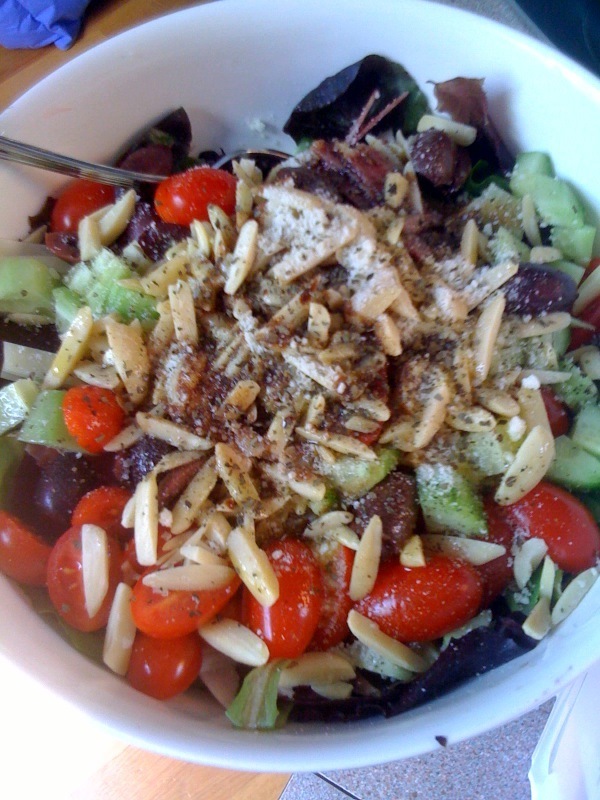 For dressing I use extra-virgin olive oil, balsamic and red wine vinegar. Cooked beans are also a nice addition (for the vegetarians), and I love slivered almonds on top. I usually sprinkle with a little Pecorino Romano cheese, or you could use your favorite hard cheese.Some thin sliced fresh basil is also a nice touch. Treat yourself to a nice lunch. Enjoy!